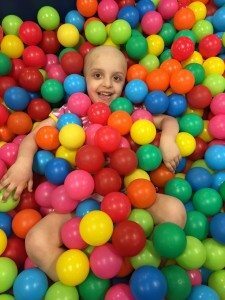 How do you tell a four-year-old she has cancer? What is the best way to explain the multitude of medical procedures she will undergo? “We were in the resource room and we saw him – a really cute duck. It was in the first week of diagnosis and we were trying to get used to our surroundings, the diagnosis and our own feelings. We went to take a look at him and he had a bandana and a tubbie,” recalls Jonathon. Belle was born with neurofibromatosis type 1 (NF1), a genetic condition characterized by changes in skin coloring (café-au-lait spots) and the growth of benign tumors along nerves in the skin, brain and other parts of the body. Some affected individuals also develop optic gliomas, tumors that grow along the nerve leading from the eye to the brain. The condition occurs in one in 4,000 people worldwide. Belle is followed closely by a team of physicians. When she developed a tumor in her jaw that began to grow, doctors conducted several tests including a biopsy. It showed she had rhabdomyosarcoma – a cancer made up of cells that normally develop into skeletal muscles. Her treatment regime calls for 54 weeks of chemotherapy plus surgery and/or radiation therapy, said her dad. Jonathon said Chemo Duck has also been very helpful in teaching their youngest daughter, Sadie, about how to interact with Belle (by not pulling her on her tubbies). Belle is treated at the Dana Farber Cancer Institute in Boston and frequently visits The Jimmy Clinic for treatments and check-ups. She recently sent a letter to the Chemo Duck creator to express their gratitude for the teaching tool. In return, they received a surprising gift: a video from 13-year-old Gabe Sipos, who was diagnosed with rhabdomyoscaroma in 2002. Jonathon said the support they received from Chemo Duck has offered them hope.